Hearty and flavorful chili with three different beans! This Vegetarian Chili is a combination of the warm and smoky flavors of cumin added to sweet butternut squash and roasted red bell peppers for a satisfying meal. Did you know that Halloween falls on a Friday this year? That’s kind of exciting news for the kids since they will probably stay up super late taking close inventory of all their loot since there is no school the next day! Little piles of candy bars in neat stacks with their favorites on one side and the stuff they’re willing to trade on the other! This is where you can see your kid’s negotiation skills come into play! lol I miss those days! I always made sure Ashley and Sam were filled with a hearty meal like chili before they went trick or treating. They were too excited to eat much, but as long as they had a few bites of something healthy, I sent them on their candy hunting way! This Vegetarian Chili is filling and full of flavor. 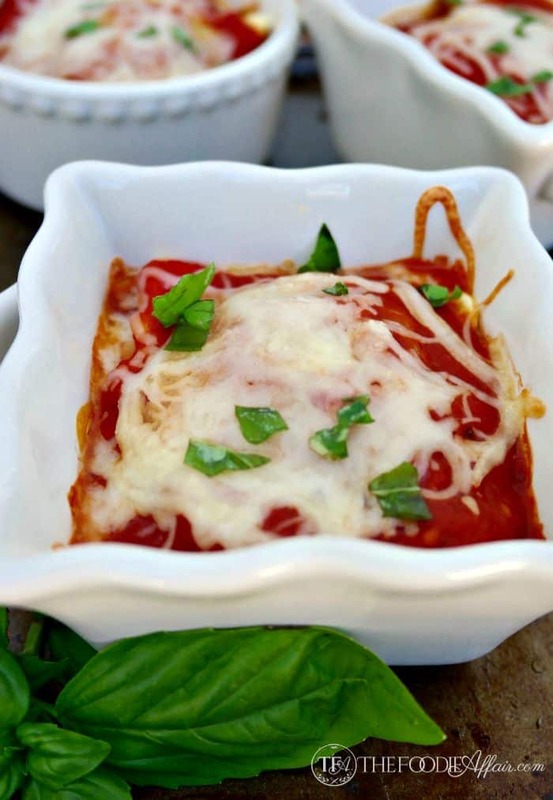 Not only a great meal for your family, but also tasty party food for a Fall gathering! The basis of this recipe is from one of my Cooking Light Cookbooks (The New Way to Cook Light, 2012), but I made some changes. I added more vegetable broth and butternut squash, toned down the crushed red peppers, and added a couple of tablespoons of cornstarch to thicken up the broth. Then I topped the chili with these rice ghosts! See how much fun we can have with sticky rice!! I had some Reynolds Kitchen ghost shaped baking liners that I used as a mold, but if they aren’t available, any cookie cutter shape will work as well as shaping the rice with your fingers. You’ll want to dampen your fingers with water or a little oil if you go that route because the rice really is STICKY! The face is made from small pieces of seaweed, which stuck to the rice like glue, so there was no repositioning eyeballs once it was on the ghost! Wouldn’t rice pumpkins be cute too?!! Cut bell peppers in half and remove seeds and membranes. For easy clean-up, line a cookie sheet with foil and put peppers skin side up. Broil for 15 minutes or until skin is black. You may need to reposition the peppers to ensure all sides are getting cooked. Remove from oven and place in a small paper bag (I used a lunch bag). Close the bag tightly so that the heat continues to steam the peppers. Let sit for 15 minutes. Remove from bag, peel skin and dice into bite size pieces. Heat a Dutch oven on medium-low heat. Add 3 tablespoons of olive oil and onion.Cook for 10-15 minutes. Stir in cumin, crushed red pepper, paprika, salt, garlic cloves stirring until flavors blend together. Add broth, bell peppers, squash and tomatoes. Simmer for 20 minutes. Remove 1/2 cup of the liquid and whisk in 2 tablespoons of corn starch, making a slurry. When well combined, stir into chili. Add beans and simmer for an additional 20 minutes. 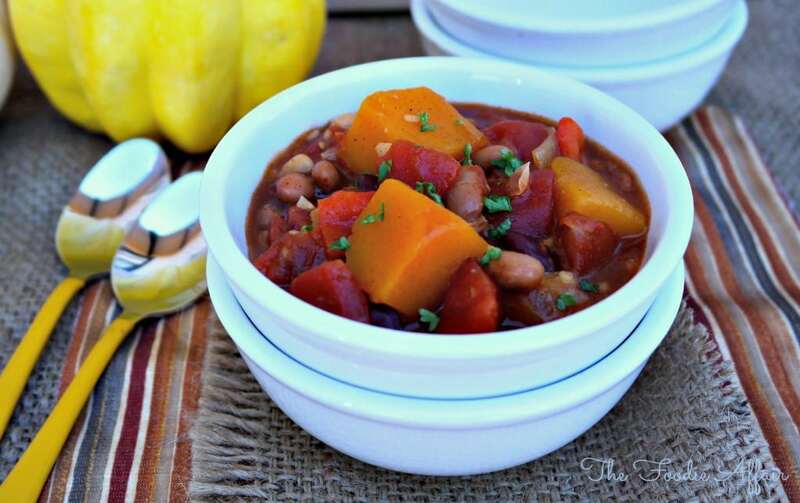 I love the inclusion of squash in this chili- it looks fabulous! I love squash too and it is tasty with the beans. Looks like a wonderful chili recipe! 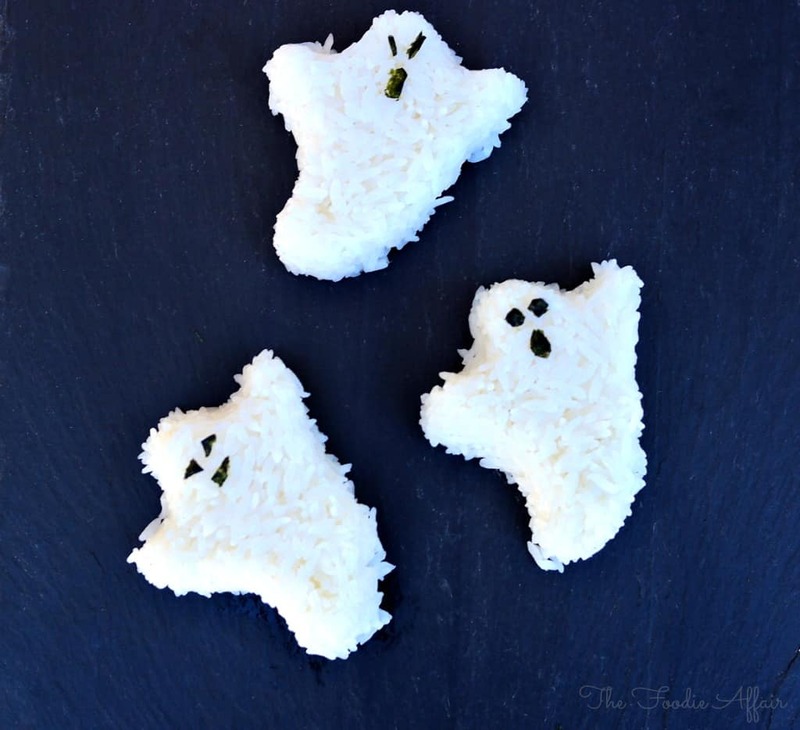 And the sticky rice ghosts… how fun and creative! Looks delicious and the ‘ghosts’ were such a cute idea. This is the second chili recipe I have come across in as many weeks adding butternut squash as one of the ingredients. Very cute rice ghost. 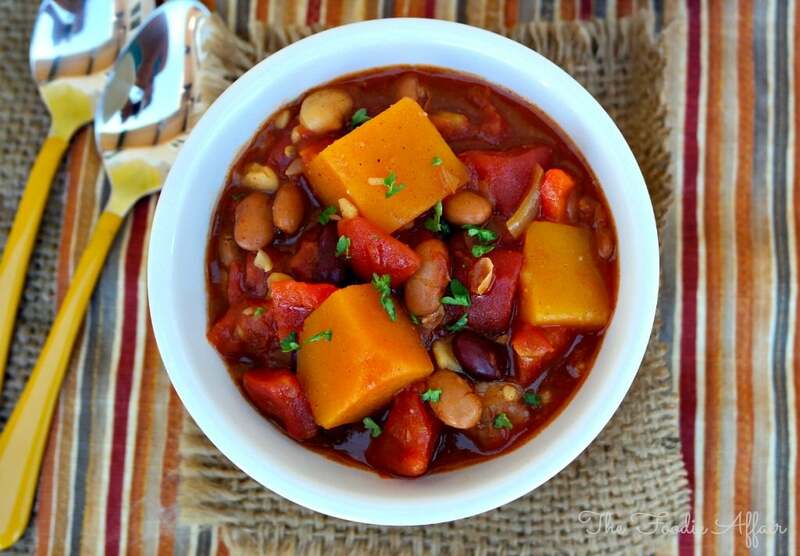 The cooler months brings out all the chili, and we can’t get enough butternut squash! Vegetarian Chili looks and sounds remarkable! I love those little sticky rice ghosts!! Awesome idea!! Thanks, Heidy! This was a fun recipe to put together! 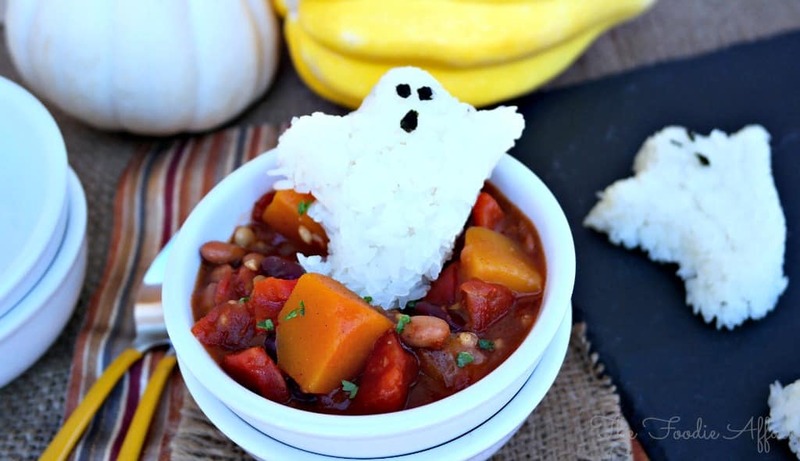 I love how chunky this chili is, and the rice ghosties are just way too cute! Sandra, I love the idea of Butternut squash in your vegetarian chili. Adding a bit of sweetness to the cumin and other veggies. Delish! The flavors definitely work together. Thanks so much KC! Love your chili and the sticky rice ghosts are absolutely the coolest! Thanks, Shelby! It was fun to put the faces on the ghosts, even if they’re a little haphazard! Great chili recipe! Very light and full of vitamins! A healthy chili recipe for sure! Thanks, Katerina! I can imagine eating this on cold days and even over Halloween. Great recipe. Thanks, Rini! It’s going to be made quite a few times for sure! Butternut squash is so good in this chili. Adds a little sweetness to the heat. Those ghosts! be still my heart. 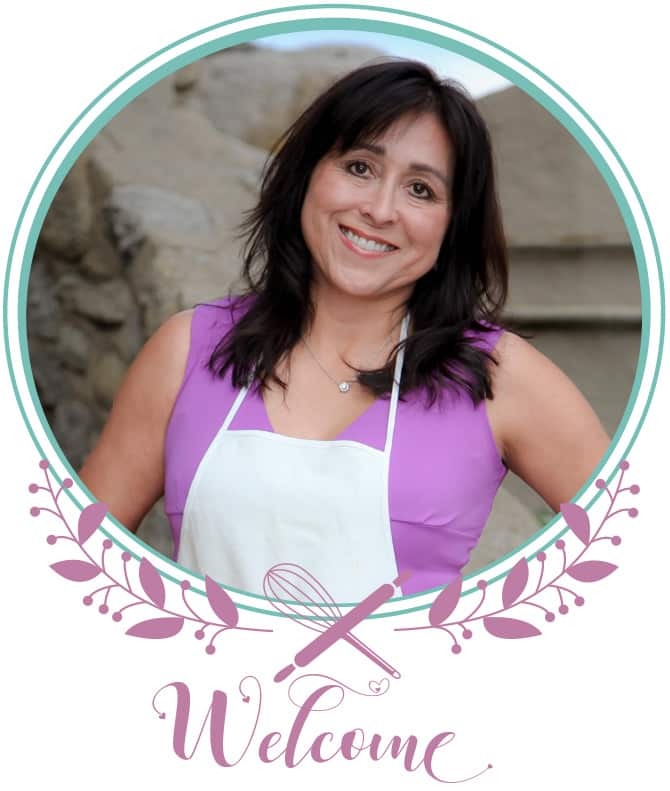 I seriously love them, and what a fun recipe.Thanks for sharing. I will be copying you! Thanks, Rachael! I can’t wait to see your spoktacular ghosts! Sounds delicious and I can’t even get over how stinkin’ cute those rice ghosts are! HeeHee – Thanks Christine! The ghosts were fun to make and tasted delish too! I love vegetarian chili. The butternut squash gives it the heartiness needed. Love the rice ghosts, they are the cutest. You’d make a wonderful grammy, my grandsons would love them. Pinned/shared. Awww, thanks, Joanne! One day…I’ll get to make these fun things for little ones again. The chili sounds fabulous! 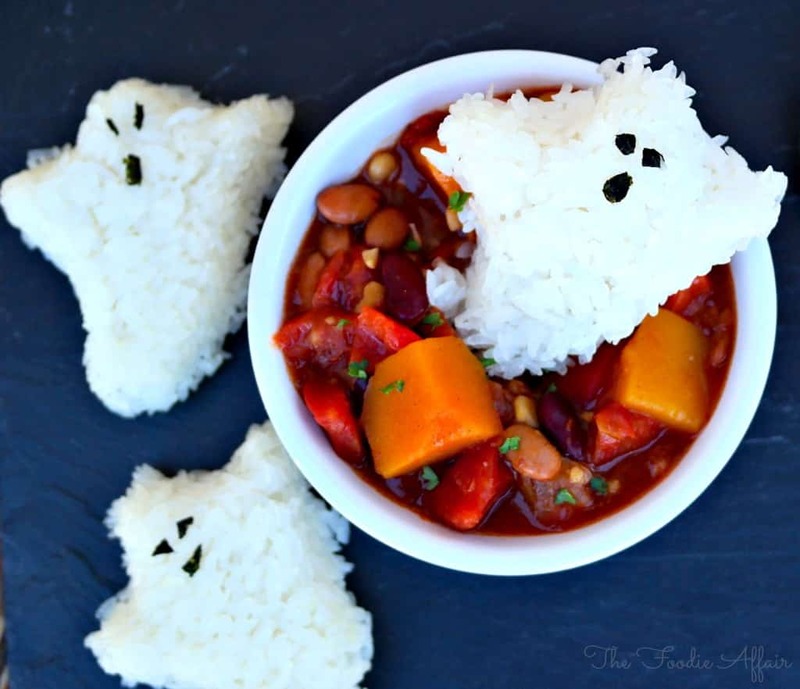 (Big fan of chili) and the little ghosts….too cute!